Subscribe to Exchange for the Working Man!! In Part 2 of this series, we created the Database Availability Group, and added both NYDAGNODE1 and LNDAGNODE1 to it. In Part 3 of this series, we are going to configure the network’s properly, and create some database’s for the DAG. As we noted last time, by default, all networks for every node in a DAG is configured for replication. We only want replication to occur over certain networks, mainly 172.16.1.0 for NY and 172.17.1.0 for London. 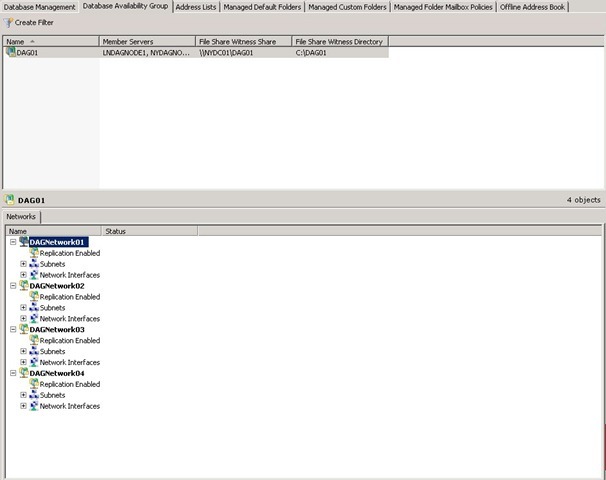 If we navigate to Organization Configuration –> Mailbox and select the Database Availability Group tab and select DAG01, we see all the networks listed. Just a side note, if you right click the label DagNetwork01 for example, you can rename it to something more descriptive. 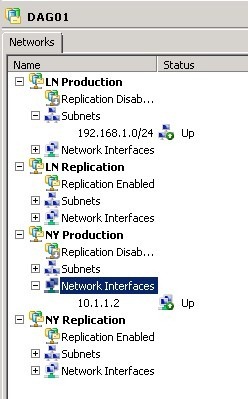 Now, it states for both NY and LN Production, that replication is disabled. 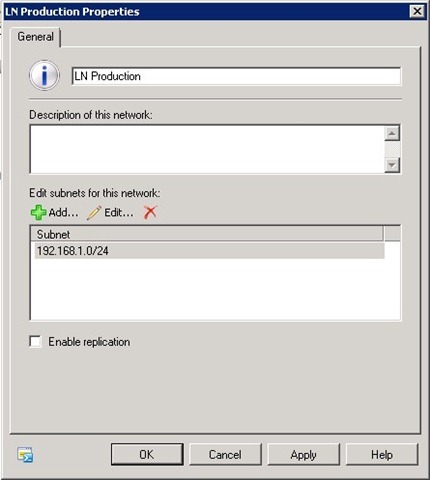 This will ensure that all replication occurs over a dedicated network. Now, it’s time to add some database’s to the DAG! Move on to the Database Management tab. You will note two database’s here, both of which are the default one for each server. 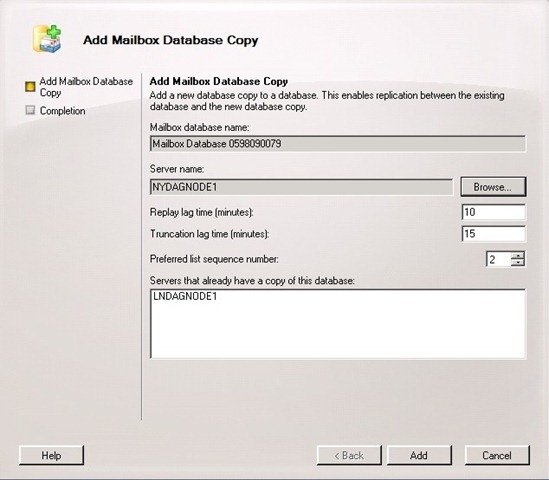 Select Add, and it will add NYDAGNODE1, as a replica for the Database. Note the preferred list sequence number. This indicates that NYDAGNODE1’s copy of this database, should be the second database activated, should something happen to Preferred List Sequence Number 1, which is the original copy on LNDAGNODE1. Now note, we have one database that’s listed as Copy Status Mounted, and one who’s Copy Status is Healthy. The Healthy means it’s not in production and is a replica. Note how it lists the servers that are hosting the database, as well as the Copy Queue Length, Replay Queue Length, as well as the Preferred List Sequence Number. The copy queue length is how many transaction logs are waiting to be copied to the node, the replay is how many are waiting to be played into the database on that node, and the list sequence is what is the preferred next copy of the database Exchange should activate, if the currently mounted one becomes unavailable. And then just add extra copies as we did above. All servers that are in the same DAG should have the same drive letter or mount point configuration. This is because all copies will have the same path to the EDB File, as well as the Transaction Log and System Files path’s. Also, since Mailbox Database’s are objects of the organization now, you need to ensure that their names are unique throughout the entire Exchange Organization. So, that’s it for the third part of this series. In this part, we configured the networks for replication, and we added copies of existing database’s, as well as created new database’s and copies into our DAG. 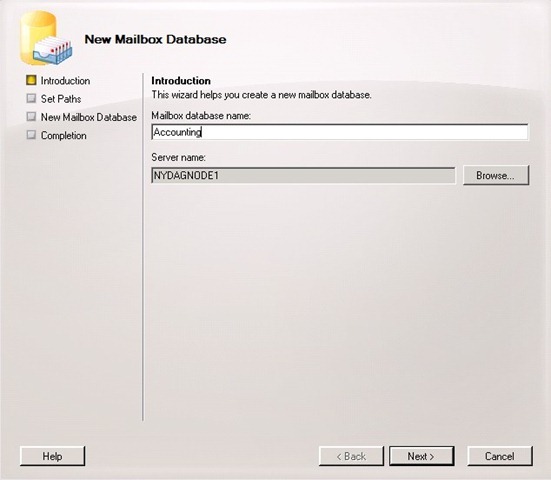 In the next part, I’ll show you how to fail over to different copies of the Mailbox Database’s, and it’s impact on the end user. This entry was posted in Exchange 2010, High Availability and tagged DAG, Database Availability Group, Exchange 2010. Bookmark the permalink. what is replaylagtime and truncationlagtime? Only Transactionlogs are copied to the passive copy..